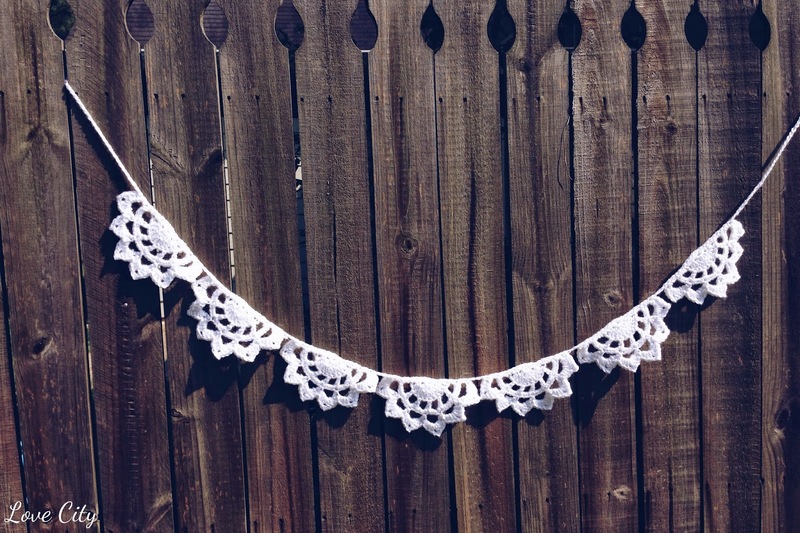 I've been dreaming up a white, doily-ish, scalloped garland for a while now. 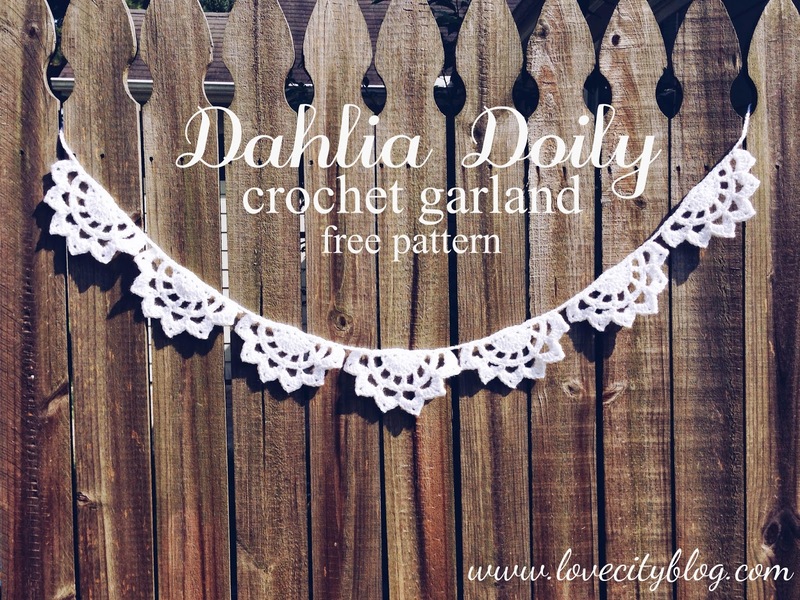 When I came up with the dahlia doily pattern, I realized that it would work perfectly as a garland! 1. Ch 3. Sl st in first ch to form loop. Ch 2. Work 5 dc in center of loop. 2. Turn. Ch 2. Dc in same st. 2 dc in each remaining st (12 total, first ch 2 counts as a dc). 3. Turn. Ch 5 (counts as a dc + a ch 3). Dc in next st. *Ch 3. Sk next st. Dc in next st. Repeat from * finishing with a dc in last st.
4. Turn. Ch 1. Sc in each st across (1 for every dc, and 3 in each ch 3 space). Finish with 4 sc in last ch 3 space. 5. Turn. *Ch 6. Sk next 3 sts. Sc in next st. Repeat from * around finishing with sc in last st.
6. Turn. Ch 1. *[3 dc, (ch 2, sc in first ch), 3 dc] in ch 6 space. Sc in next sc space. Repeat from * around, finishing with sc in last st. Fasten off, weave in loose ends. 7. When ready to join, ch 40. Sc evenly across flat edge of first doily (approx. 20 sc). Ch 3. 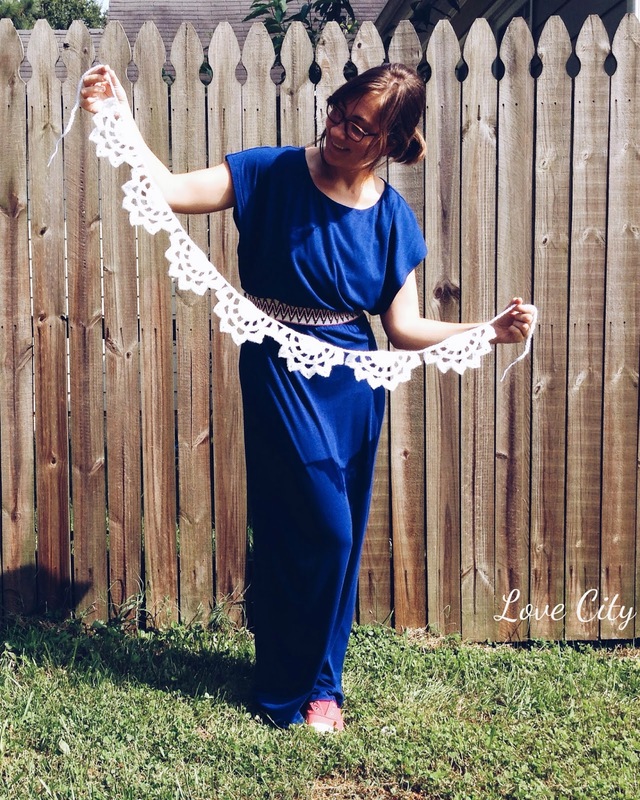 *Sc evenly across flat edge of next doily. Ch 3. Continue from * until all doilies are connected. Finish with ch 4. Fasten off. Now, I'll let you in on a little secret! I wanted the doilies to keep their shape. I just love the pretty little pointed "petals" and I didn't want them to be all floppy. I took some spray starch (that we use on Curtis' white Sunday shirts) and sprayed what I deemed to be the back side of the garland. I then ironed across the whole thing (still on the back side). Once good and dry, the garland was perfectly stiff! I was a little worried about the heat of the iron meshing all of the fibers together, but luckily the detail of the stitching on the front of my garland was still in tact! I think if I had used a wool yarn, it would have started to "felt" though, so take care if you try this! 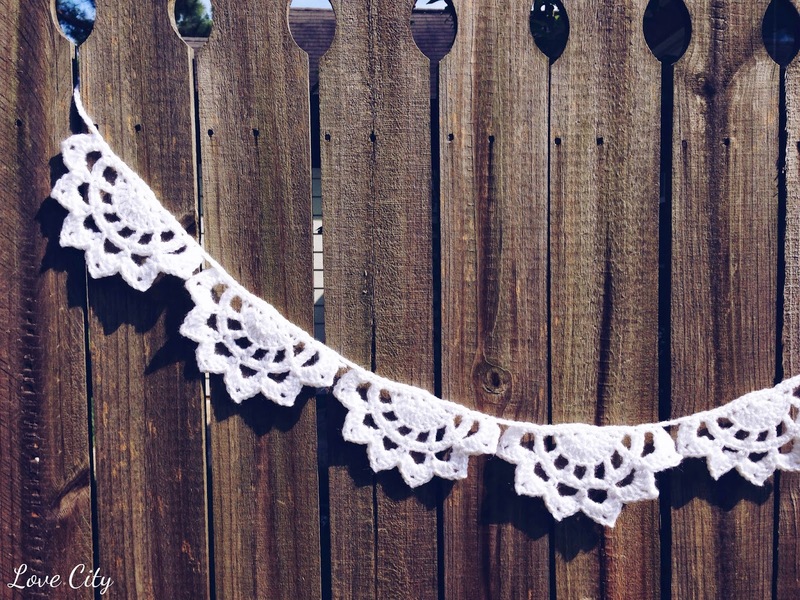 I really like how the dahlia doily garland turned out! I especially love it in white. 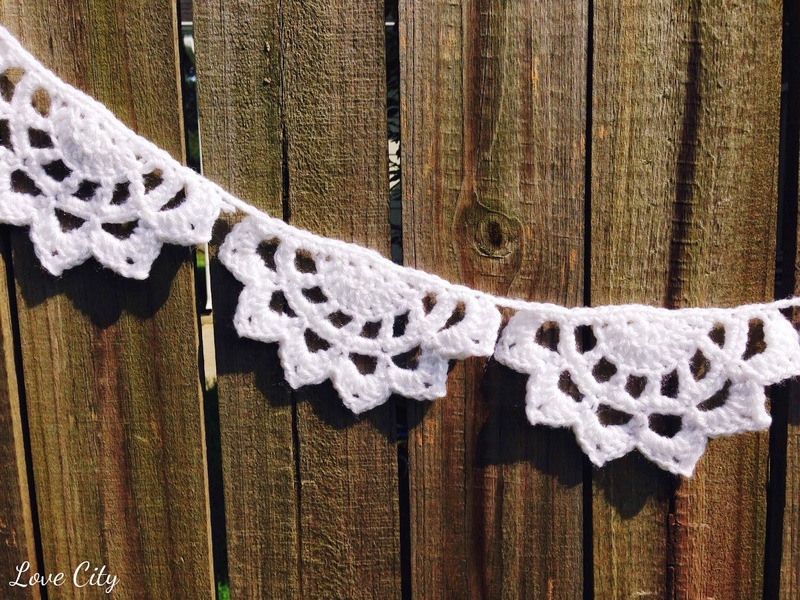 It looks great hanging along my mantle right now, but it would be so cute as party or wedding decor or even hanging in a little girl bedroom! If you try it for yourself, I'd love to see how it turns out! And as always, email me with any questions @ LindsayHaynie [at] gmail.com! I also like your dress! Did you make it yourself? 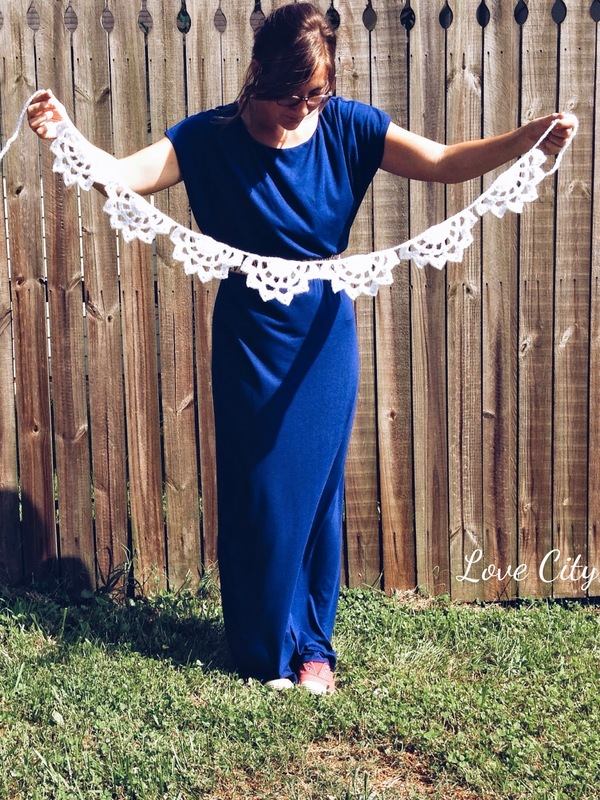 If so could you post a link to the pattern? my goodness, what a pretty item! I'm a bit biased because my little girl's name is Dahlia :-)...I'll try this in some other colors as well and maybe use as room decor. I'll make sure to share a photo. thank you so much for posting and sharing.